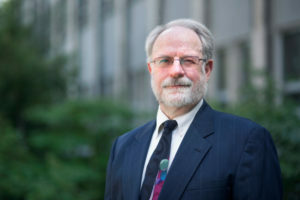 Mark Edelman, a professor of economics, utilizes the principles of microfinance to help low-income Iowans start businesses. Photo by Christopher Gannon. AMES, Iowa – The spirit of entrepreneurship runs deep for Mark Edelman. Growing up on a farm in a single-parent household, he realized early on that sometimes the best opportunities are the ones you create by yourself. To do so, he’s developing ideas that differ from conventional thinking in some striking ways. But the core of his approach remains rooted in his experiences on the farm and in his hometown. Now, 35 years into a career as an economist at Iowa State University, he’s devoted much of his work to helping others transform their ideas into successful income-generating ventures. Edelman grew up on a farm outside of Sabetha, Kansas, a community of around 2,500 in the northeastern part of the state. He was four years old when his father died. His mother kept the family together, went to work in town and paid off the farm debt. Edelman split the farm chores with his brother and kept busy with 4-H, FFA and school activities. Edelman learned at an early age about being self-reliant and working with others, key qualities for anyone thinking of starting a business. And he didn’t have to look far to find examples of successful startups. Sabetha was a normal, agriculture-based community until two brothers started to build extruders. The business struck at just the right time after World War II to tap into growing demand among baby boomers for breakfast and snack foods. “A global sales force developed, and there have been several local spinoff companies over the decades,” Edelman recalled. 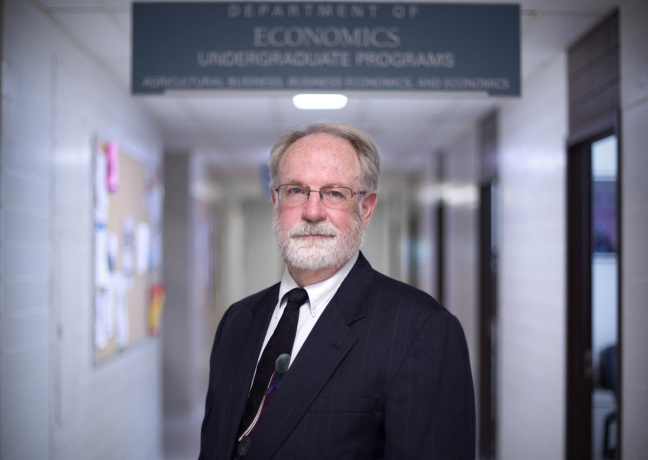 A combination of Edelman’s involvement with 4-H, FFA, high school student government and farming enterprises led him to study agricultural economics at Kansas State University. In 1974, he was elected student-body president at Kansas State, further reinforcing his interest in public policy. Edelman drove a professor to extension meetings for discussions on farm bills and tax policy and decided to follow that path. He continued his education with a Ph. D. at Purdue, where he studied under several noted ag policy economists. His first job after graduating took him to South Dakota State University as an extension economist. During the farm finance crisis of the 1980s, he organized lender surveys and financial management workshops for farmers. At Iowa State, Edelman teaches an economic development course but spends most of his time involved in extension and research programs. His work reaches Iowa’s rural and urban communities and businesses large and small. In 2002, he became director of the ISU Community Vitality Center (CVC), which helps to stimulate innovation and philanthropy across Iowa. CVC has supported over 200 community projects involving rural-urban policy studies, entrepreneurship development and philanthropy. Mark Edelman learned the value of entrepreneurship as a child on his family’s farm in northeast Kansas. Photo by Christopher Gannon. Some would-be entrepreneurs with great ideas sometimes struggle to get their enterprises off the ground. Due to the higher risks, some lenders avoid small business startups, particularly when there are credit issues, lack of collateral or lack of experience. Some lenders may not finance any small startups, no matter how good the idea, Edelman said. But microfinance, an approach that focuses on providing small loans and coaching to small businesses, can help some ventures get started. For the past decade, Edelman has worked with community leaders to create two nonprofit microfinance programs. The Iowa Microloan Program was launched in 2008 and has made 100 loans of amounts between $5,000 and $50,000 to Iowa entrepreneurs with workable business plans, but who are unable to access conventional loans. In 2012, Edelman started working with a group in Des Moines on a microfinance program targeted to low-income minority women entrepreneurs. This program, called Solidarity Microfinance, differs from conventional lending and Edelman’s previous microfinance efforts in that it requires no credit scores, no collateral, no guarantors, and no written business plans. The unconventional approach sprang from the ideas of Muhammad Yunus, a 2006 Nobel Peace Prize Laureate from Bangladesh who in 1983 founded the Grameen Bank, which focuses on helping impoverished populations. Yunus developed peer group lending methods that have since been adopted in developing countries globally but are not widely used in the United States. Edelman worked to bring the Grameen model to Solidarity Microfinance. In Solidarity, women who want loans to start a business form five-member groups that meet weekly to make loan payments, deposit savings, and discuss challenges in their businesses and community. The first Solidarity loan is typically $1,000 for a term of six months. Clients who display satisfactory attendance and repayment become eligible for larger loans. Solidarity Microfinance was launched in October 2014. There have been 118 low-income women participants during the past 20 months. The program has experienced 100 percent loan repayment by Solidarity members on all loans made since the start of 2015. At the other end of the entrepreneurial spectrum, Edelman is working with rural leaders on a “Rural Venture Accelerator” initiative. CVC has organized bi-annual forums for the last three years with presentations by rural entrepreneurs and venture capital leaders. The first client Edelman assisted was USM Weartech based in Eldora. The company developed a proprietary process for applying tungsten carbide to tillage tools that extends useful equipment life. Edelman introduced the owner of USM WearTech to the owner of Bauer-Built in Paton. A few months later, the two companies signed a 5-year manufacturing agreement to create a robotics manufacturing line that can produce a million parts annually. Another client to benefit from the program was Natural Soy Products based in Brooklyn, Iowa. The company has 71 green products that include cleaners, adhesives, solvents and lubricants all made from soybeans, corn and other bio-based products. Edelman said he’s helping the company with marketing strategies and assistance to connect with markets. “Natural Soy Products are biodegradable and have less impact on the environment and water quality. Society – particularly millennials – wants green solutions,” he said. In his latest effort, Edelman is leading a team of 24 farm, ethanol and business leaders from western Iowa, Texas, Kansas and Arkansas, plus two engineering firms that are competing in a global Carbon XPRIZE challenge. The four-year competition will award $20 million to the winners. The challenge seeks to discover the best approaches for capturing carbon dioxide from coal and natural gas power generation plants and then converting it to higher-value products. “The goal in working with strategic rural ventures is to help them solve their problems so they can grow, add value and diversify the rural economy,” Edelman said. “If they’re successful, future generations will have greater opportunities in rural America,” he said.